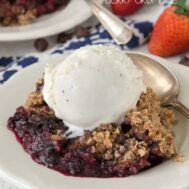 This Slow Cooker Berry Crumble is crunchy, sweet, and gooey AND it's made in the Crockpot! It's got less sugar but tastes better than any other crumble I've ever made! Whisk flour, oats, Truvia Brown Sugar Blend, cinnamon, and salt in a large bowl. Dice butter into small chunks and add to the mixture, cutting it in with a pastry cutter until the mixture is crumbly. Stir in chocolate chips, if using. Set aside. Sprinkle the Truvia Baking Blend, lemon juice, and cornstarch over the berries and toss to coat. Spray the bottom of a 5-7 quart slow cooker with nonstick cooking spray. (You can also use a slow cooker liner, but spray it with nonstick spray as well.) Add the fruit and juices, then top with the crumble topping. Place a paper towel over the slow cooker opening, then cover with the lid. Cook on high power for approximately 2 1/2 to 3 hours, or until the top is wet looking (no powdery mixture remains) and the edges are bubbly. Serve warm with low-sugar ice cream or whipped topping.